Five Dollar (And Under) Finds! 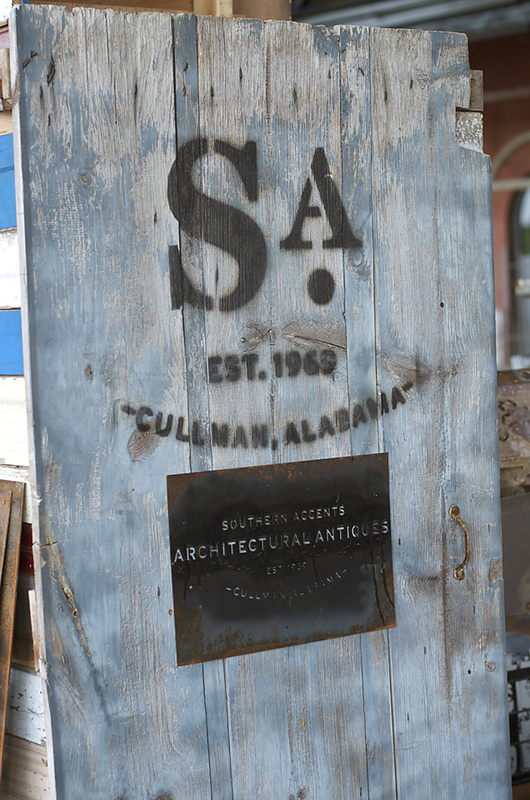 Southern Accents is an architectural salvage store, but walk in our showroom or visit our website and you will quickly see that we are SO much more! 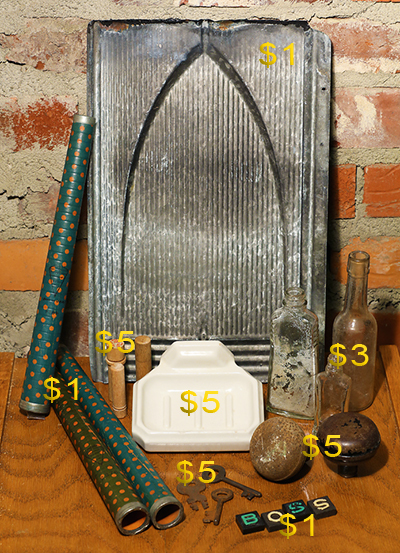 We have a fantastic collection of small salvage items that lend themselves perfectly to creative DIY or salvage art projects. All of the items shown above are $5 or LESS!! When on a salvage mission, quite often there are unique, small items that we are able to rescue. There are also a lot of small items that are architectural in nature that we remove directly from the house or structure whenever possible. Salvaged door knobs and hardware, skeleton keys, tin shingles, staircase spindles, small trim pieces, even salvaged wood scraps… all of these small items can be repurposed. We’ve seen so many creative ideas from our customers and others who have turned these items into everything from beautiful jewelry to unbelievable works of art. As children, most of us have been asked at some point, “Were you raised in a barn?” This question typically comes from a mother upon discovering a door that was left wide open invariably by the child! Whether open or closed, there is a fascination with barn doors. Perhaps it is the barn door that evokes fond memories for those who grew up around or on a family farm or maybe it is just a reminder of more simple times. Whatever the appeal, barn doors are currently a popular decorating trend in homes and businesses. 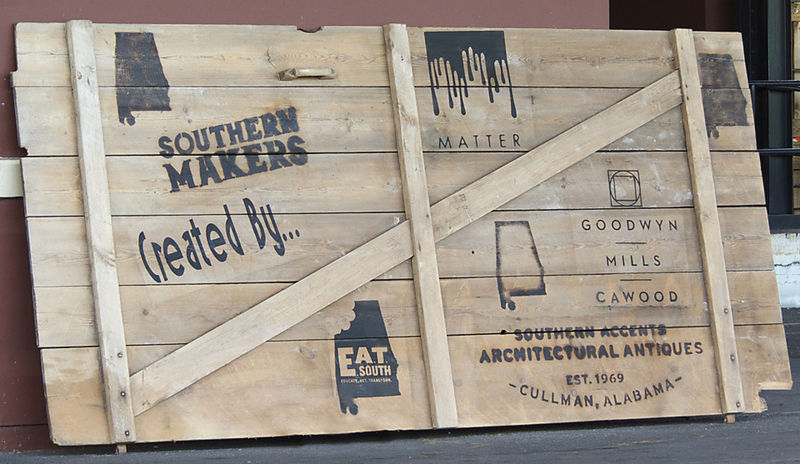 The logo of each Southern Makers 2014 curator was stenciled onto this large barn door and displayed at the event. Salvaged barn doors are being repurposed in a variety of ways. We used several recently as a design element for Southern Makers. 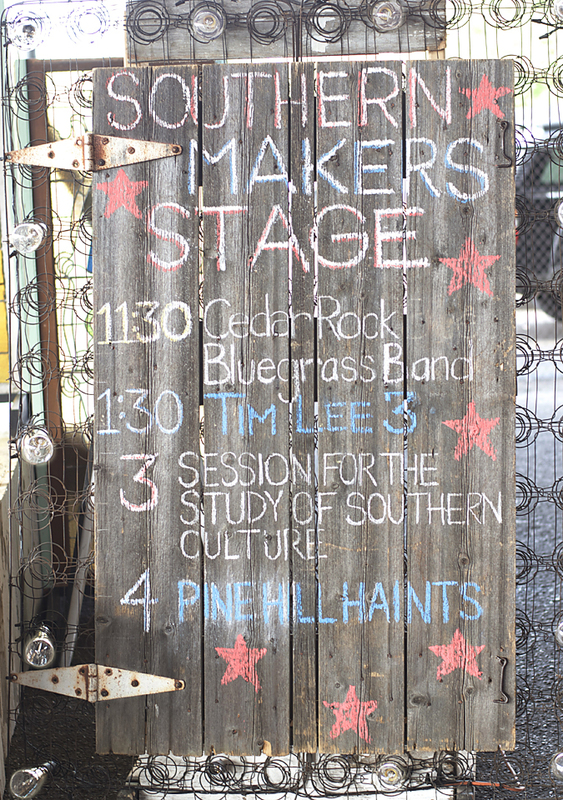 The logos of the 2014 Southern Makers curators were stenciled on to a large door and displayed at the event. A smaller salvaged barn door was placed to the side of the stage and used to display the days performance schedule. The door was mounted to a set of salvaged box springs outlined with Eidson bulbs to give the appearance of an event marquee. We used colored chalk for the stage display which can be cleaned off, allowing us the ability to reuse this door for future events. Logos stenciled onto an old barn door and used for marketing purposes. A quick search on Pinterest will pull up a long list of creative ideas on how to repurpose old barn doors. Salvaged barn doors are being used as headboards, mantel decorations, wall decor, baby gates and table tops. But mostly, they are being hung and used as interior sliding doors. Sliding doors take up less room, making them an attractive solution for closing off or hiding areas such as pantries, closets and laundry rooms. 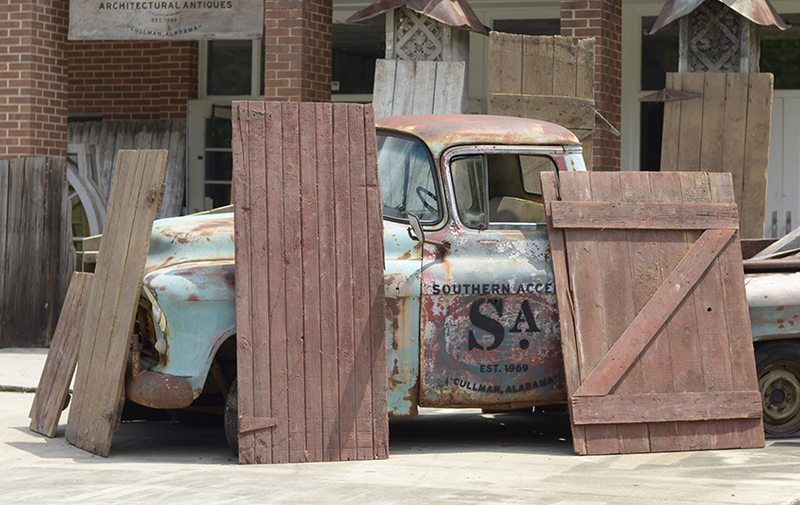 Just a few of the salvaged barn doors available at Southern Accents Wood Warehouse. This past week we received around twenty old barn doors of various sizes, colors, and condition. Can’t find an old barn door in the size you need? We can custom build a door using salvaged wood to suit your specific need. The beauty of a custom built door from salvaged material is that you get the rustic, worn, vintage look in the exact dimensions needed for your project! Stop by our wood warehouse and take a look at our selection of salvaged barn doors or talk to us about a custom project. We are available Tuesday – Friday from 9am to 5pm and Saturday from 10am to 4pm, Monday by appointment only. 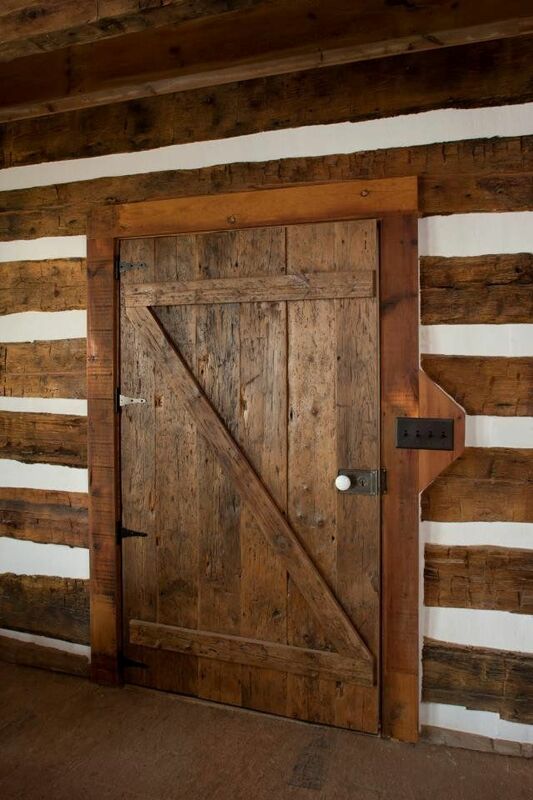 This barn door was custom made from salvaged materials for a customer. Of all the architectural pieces that we salvage, none capture our attention and mesmerize us the way a beautiful piece of stained glass does. Gazing through a multi colored window as the suns rays penetrate the textured glass panes is fascinating. Being makers ourselves, we are awed by the creativity of artists as well as the creative process it takes to produce these works of art. Through the years, we have had many stunning pieces pass through our showroom including this 200 year old window shown below. This 200 year old stained glass window originated from a church in Wales. We love this quote from Elisabeth Kubler-Ross, “People are like stained-glass windows. They sparkle and shine when the sun is out, but when the darkness sets in, their true beauty is revealed only if there is a light from within.” There is a romance between the mediums used in the creation of stained glass. While the fragments of colored glass completely contrast with the copper foil or lead came, they are still dependent on one another… it is the seamless intertwining of the two that creates a stunning work of art. 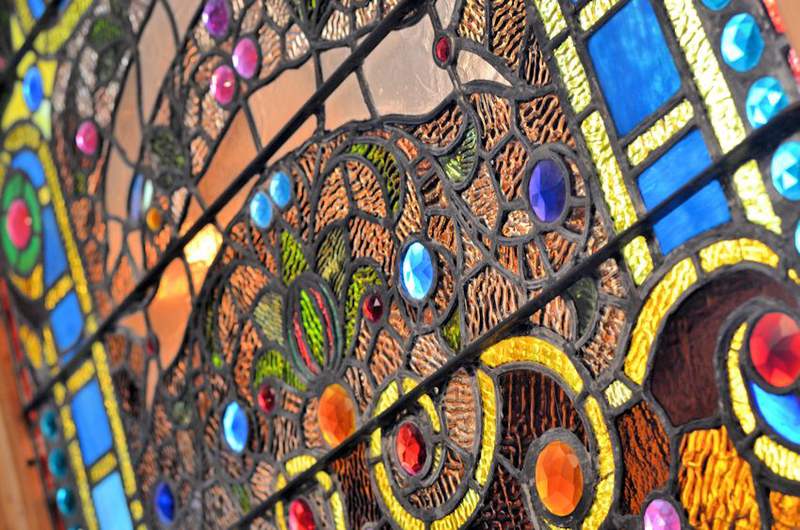 This jeweled stained glass window is the most gorgeous piece that we have ever had pass through our showroom. The history of manmade glass dates all the way back to 2625 BC with the discovery of glass Egyptian beads. The earliest surviving example of pictorial stained glass is the 10th century Head of Christ. Fragments were excavated in 1912 from Lorsch Abbey in Germany. In addition to it’s sheer beauty, there is so much rich history surrounding stained glass it is impossible for us not to love it! This beautiful window is one of 7 that we recently acquired. We have received several gorgeous pieces of stained glass recently. To view all of our incredible windows and to see more detailed pictures of them, visit our website at www.sa1969.com or stop by our showroom. 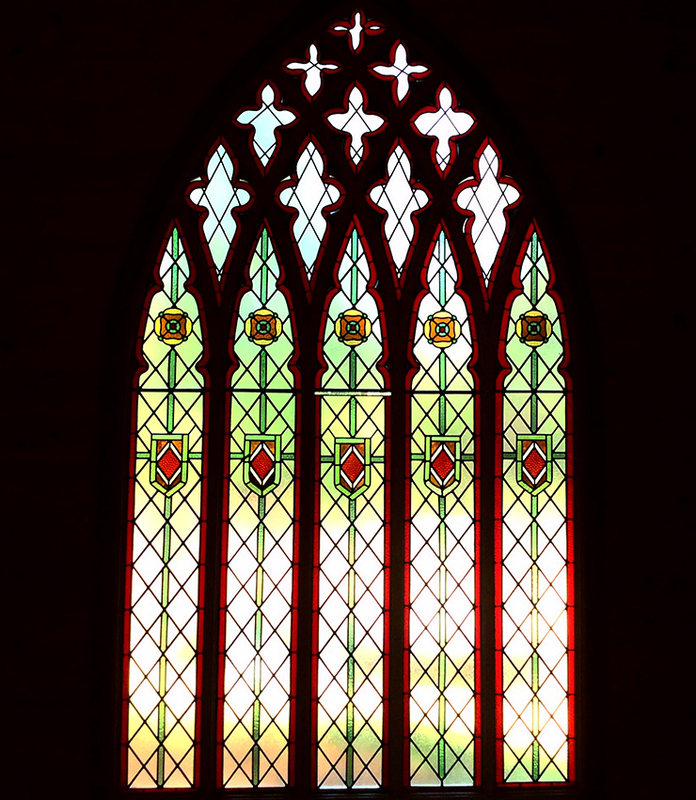 The stained glass can be found on the Antique Windows page. Our showroom is open Tuesday – Friday from 9am till 5pm and Saturday from 10am till 4pm. Closed Sunday, Monday by appointment only. Southern Accents is a family owned and operated business that started in 1969 in the garage of Dr. Garlan Gudger, Sr. Talk to his son, Garlan, Jr., and he will tell you that the success of this business is due not only to his father’s tireless efforts throughout the years, but to his genuine love of architectural antiques and his passion for preservation. Garlan, Jr. describes family vacations growing up resembling an episode of Sanford and Son! 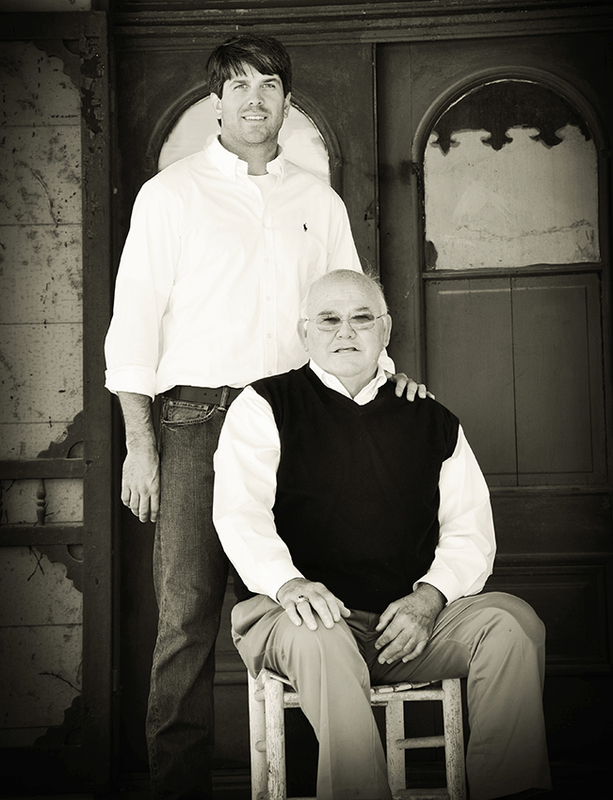 “We would leave out in the family van and return with a U-haul hooked to the back filled with all kinds antiques and architectural pieces!” This passion has been passed down from father to son, who took over the business in 1999. Dr. Garlan Gudger, Sr. and Garlan, Jr.
Because of health issues lately, Dr. Gudger is unable to spend as much time at the store as he would like but loves to stop in and visit with former customers whenever possible. 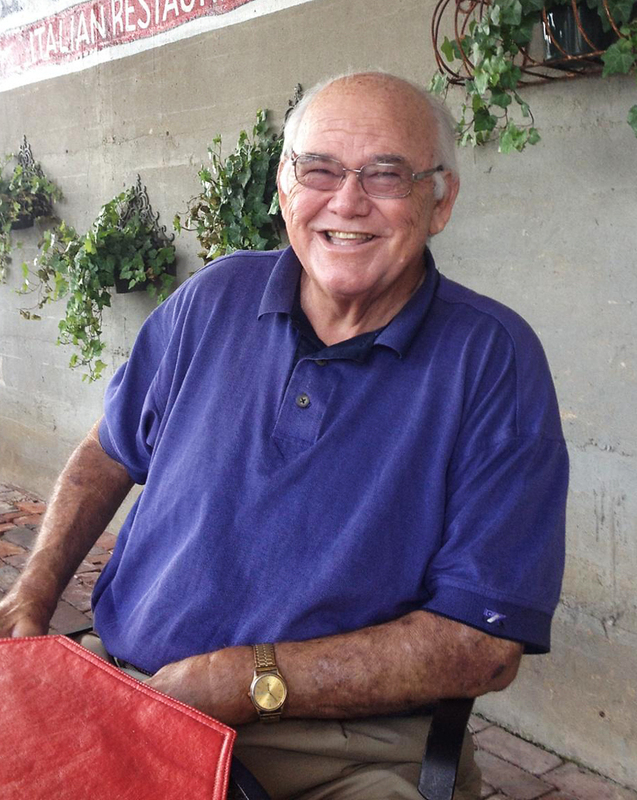 He is currently doing well and has been the recent recipient of several prestigious recognitions which include an award from the Joslin Diabetes Center in Boston for surviving 62 years of Type 1 Juvenile Diabetes. Dr. Gudger, who was diagnosed at the age of 10, credits a life long regimen of exercise, his participation in sports, and the good Lord for his survival. This past April, Dr. Gudger was inducted into the Cullman County Sports Hall of Fame and was also recently named as one of the top 5 Outstanding Alumni from Tennessee Tech in Cookville, Tennessee. This past Thursday night, July 31, 2014, Victim Services of Cullman hosted it’s 3rd Annual Fundraising Roast honoring Dr. Garlan Gudger, Sr. The roast, which was held at Terri Pines Country Club, was a fun evening filled with found memories, memorable stories and a few pokes, prods, and jabs along the way! Dr. Gudger was excited to spend the evening with family, old friends, former customers and colleagues, as well as former football players from his coaching days! The evening kicked off with a meet and greet followed by dinner and then the roast. Dr. Gudger would like to thank everyone who attended and participated in the roast. A great evening was had by all! All proceeds from this event will help support victims of domestic and sexual violence.